West Nile virus is a mosquito-borne virus that can cause encephalitis (an inflammation of the brain) or meningitis (inflammation of the lining of the brain and spinal cord) in humans and other animals. The virus is named after the West Nile region of Uganda where it was first isolated in 1937. The virus appeared for the first time in the United States during a 1999 outbreak in New York that killed seven people. The first human case of the virus in Virginia appeared in 2002.
Who can get West Nile virus infection? Anyone can get West Nile virus infection if bitten by an infected mosquito; however, even in areas where transmission of West Nile virus is known to be occurring only a small proportion of mosquitoes are likely to be infected (1 in 100). Even if a person is bitten by an infected mosquito, the chance of developing the illness is only 1 in 200. The elderly and persons who have weakened immune systems are at greater risk of developing a more severe form of the illness. 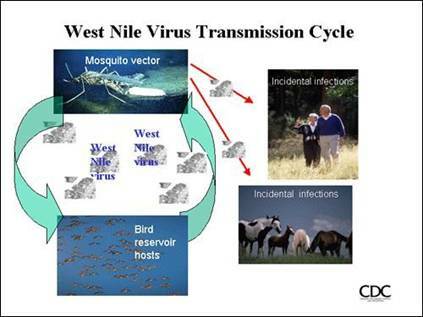 West Nile virus is spread to humans, birds, and other animals through the bite of an infected mosquito. A mosquito becomes infected by biting a bird that is carrying the virus. West Nile virus is not spread from person to person, but a small number of cases were a result of blood transfusions or organ transplants from infected people. There may also be a risk of infected mothers transmitting the virus to their unborn or nursing children. What are my chances of getting West Nile virus? In areas where West Nile virus has been detected, only a small proportion of mosquitoes are likely to be infected. Most people bitten by an infected mosquito do not become sick. Less than 1% of all people who are infected will become seriously ill. The symptoms generally appear about 3 to 14 days after exposure. People over age 50 are at greater risk of severe illness. Milder symptoms include: slight fever, headache, body aches, swollen glands, and sometimes a skin rash. Severe symptoms include: high fever, intense headache, stiff neck, and confusion. I think I have symptoms of West Nile virus. What should I do? Most people who suffer a mild illness due to West Nile virus recover, and no treatment is necessary. Contact your health care provider if you have concerns about your health. If you or your family members develop symptoms such as high fever, confusion, muscle weakness, and severe headaches, you should see your doctor immediately. Am I at risk of contracting West Nile virus in the Rappahannock Area Health District (RAHD)? RAHD began bird surveillance in 2002 tracking the spread of West Nile virus in the native bird population, making it possible to predict an outbreak of the virus in the human population. By the end of the 2003 season, the data resulting from the RAHD surveillance showed that West Nile virus was fully established in the native bird population in the Rappahannock Area, an indication that our community is at risk from the disease. What is RAHD doing to respond to the threat of West Nile virus within the district? In order to more fully comprehend the extent of the virus’s spread within our community, RAHD and the local governments established a West Nile virus specialist position within RAHD. This specialist performs mosquito surveillance and coordinates bird surveillance throughout the season (April through October) and also provides support to the localities for mosquito-related inquiries and complaints. In addition, the West Nile virus specialist coordinates RAHD’s educational outreach program which includes educational literature, posters, and presentations. Contact information for RAHD’s West Nile virus specialist is available by clicking on theContact Us link located on the left side bar of this Web page. Although RAHD is not collecting dead birds, we are very interested in knowing the location of dead birds for our surveillance program. Call your local health department to report a dead bird. A dead bird can be disposed of by burying it or placing the bird in a double layer of plastic bags and putting it in the trash. Be sure not to handle dead birds with your bare hands and wash hands immediately after disposal. How can I help prevent West Nile virus? The best thing you can do is to eliminate mosquito breeding areas around your home and to protect yourself from mosquito bites. Several species of mosquitoes most likely to carry West Nile virus can breed in containers in your own backyard. See our Controlling Mosquitoes and Preventing Bites page for additional information. Where can I get more information about West Nile virus in the Rappahannock Area Health District?